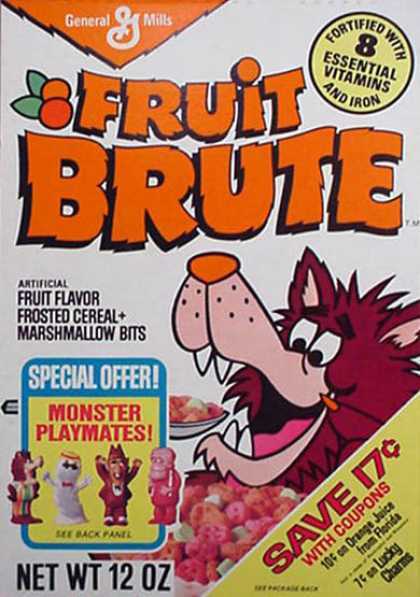 But today we're talking about the dearly departed cartoon werewolf Fruit Brute, and his frosted fruit-flavored nuggets and vaguely limeish marshmallows. Because nothing says “nutritious breakfast” like a bloodthirsty creature of the night. After a good run from the mid-'70s to the early '80s, today he’s nothing more than a pointy-toothed, lycanthropic and fairly disturbing memory. Or, hmmm -- maybe he's still out there, baying at the moon, flicking at fleas and recalling the glory days when the breakfast cereal aisle was an even scarier place to roam. Ow-ooooooooo! And please pass the milk. I read somewhere that Tarantino used fake or defunct brands a lot to avoid having to pay royalties to the brand-owners.